Each year, at the OutDoor show in Friedrichshafen, Germany, we enter our newest gear in the Industry Award competition. For the past several years we've won awards for the Ergo Hammock Combi, DownMat UL 7, and SynMat UL 7. And this year we've won again for the Lightning 45 and Lightning 60 backpacks. These packs won't be available until March 2013, but they will be worth the wait! Exped has won an OutDoor Industry Award at the OutDoor show in Friedrichshafen, Germany. 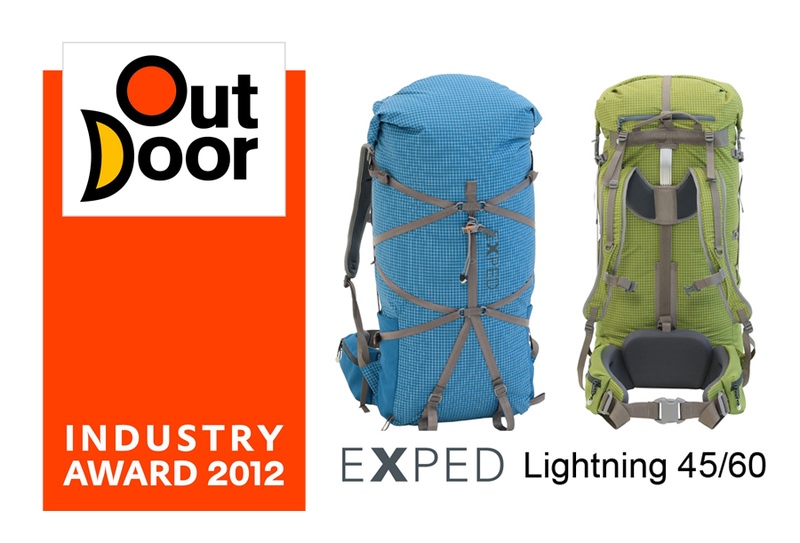 For the 3rd consecutive year, Exped has won an award at the OutDoor show, this time for the new Lightning 45/60 packs in the lightweight backpack category. "We are delighted to get this award in the pack category at Friedrichshafen" said Ted Steudel, director of sales for Exped LLC in North America. "Our pack line has been very well received by customers in Europe over the past few years and we're excited to be bringing the line to North America in 2013. After using the Lightning series prototypes last fall and winter we've been amazed at the solid load control the new T-Rex frame provides. Especially when you consider the total weight of the packs is about 1 kg or just over 2 lbs! These packs handle even heavy loads with ease!" Lightning 45/60 will be available for women and men in March of 2013. Made of durable and lightweight Dyneema Gridstop fabric and featuring Exped's exclusive T-Rex single stave frame, these packs balance plenty of volume, weight reduction, freedom of movement, durability, back ventilation, and roll-top weather protection. Exped's hallmark innovation and clean design lines are immediately noticeable. From 301 product entries , the awards jury delivered a total of 46 awards at this year's show. Since 1997, the Exped team has designed and built the highest quality specialized gear for the active outdoor enthusiast. This equipment is designed to appeal to everyone from the casual hiker of the Appalachian Trail to the technical climber in the Himalayas. Exped means expedition equipment, and through ingenious simplicity and innovation Exped delivers the maximum outdoor experience with minimal means. Exped is based in Zurich, Switzerland with a subsidiary, Exped LLC, in Seattle, USA.